Even as a kid, Ann Ahmed knew the exact route of her career path. This is someone who wrote her first menu when was she was a sixth-grader. While her family was in the business, she was encouraged to direct her professional aspirations elsewhere. Rather than attend culinary school after graduating from Kennedy High School in Bloomington, Ahmed enrolled at San Diego State University and pursued a degree in elementary education. That’s when the restaurant business called. Literally. She was on the way to her college commencement when the phone rang. There was a restaurant for sale in Brooklyn Park. Did she want to return to Minnesota and buy it? She did, and she’s been at the helm of Lemon Grass Thai Cuisine for the past 13 years. Now she’s embarking on the next phase of her career, launching her second restaurant, one that reflects her Laotian background. 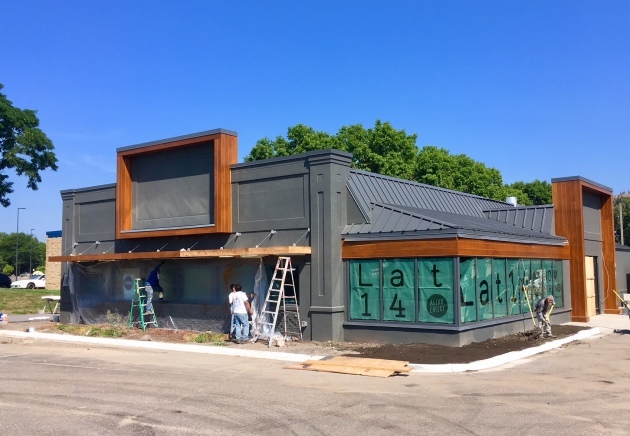 She and her husband and business partner, Tarique Ahmed, are calling their new venture Lat 14 Asian Eatery — so named because the 14th latitude runs through Laos, Vietnam, Cambodia and Thailand. The restaurant is located near Boone Av. N. and Hwy. 55 in Golden Valley, in a decades-old former Perkins. Guided by Shea Design of Minneapolis, the building is undergoing a remarkable transformation, erasing thoughts of Tremendous Twelves and Magnificent Sevens on the both the exterior (the addition of a 50-seat patio helps, a lot) and the interior, which has been completely gutted and remade. Post-demolition, the wide-open dining area — anchored by a showy exhibition kitchen — is all about handsome light fixtures, reclaimed wood, sleek tile, a hefty communal table and a granite-topped bar. A metal truss roof — hidden for decades under acoustical tile — has been exposed, raising the ceiling several crucial feet. “You don’t feel trapped now,” said Ahmed. Instagrammers will have a field day with the eye-catching mosaic tile floors, as well as the sign in the restroom that reads, “From Asia with love” in pink neon. As for the food, “It’s inspired by my roots,” said Ahmed, who landed in Minnesota as a four-year-old refugee. The “our” is Joshua Walbolt, a Lemon Grass vet, has been tapped as Lat 14’s executive chef. Ahmed and Walbolt are testing recipes right now. Expect to encounter dishes along the lines of fish wrapped in banana leaves, seasoned with dill and steamed (“Traditional and clean,” said Ahmed) and a clear broth with rice noodles, a favorite in northern Laos. The restaurant’s target opening date is a vague “early fall.” Until then, Ahmed will be monitoring the construction progress. And cooking. By the way, Ahmed hasn’t forgotten about teaching. As for adapting to the pressures of operating two restaurants, Ahmed isn’t worried.